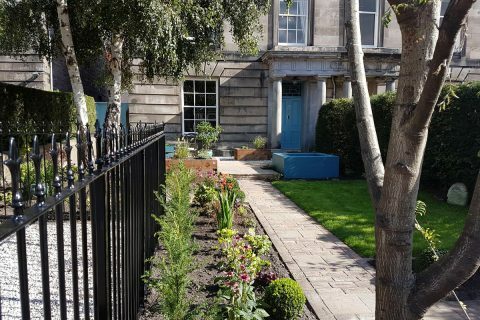 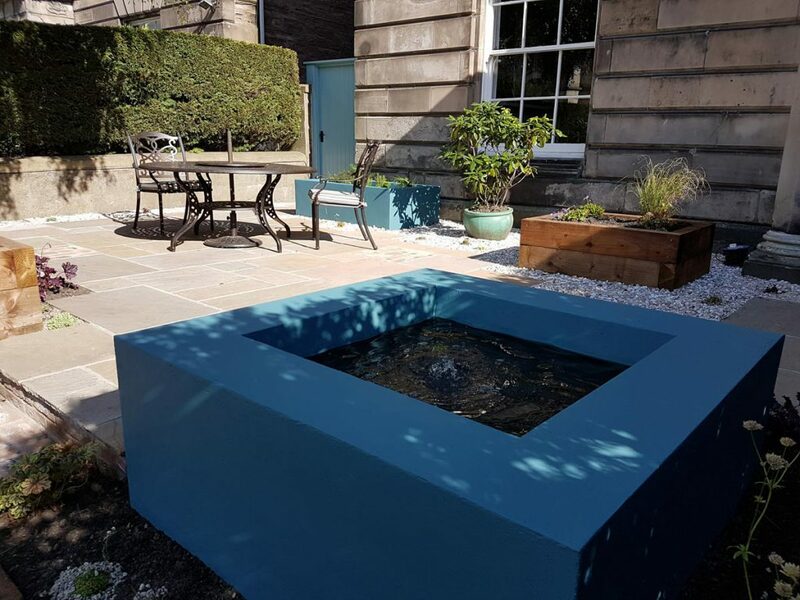 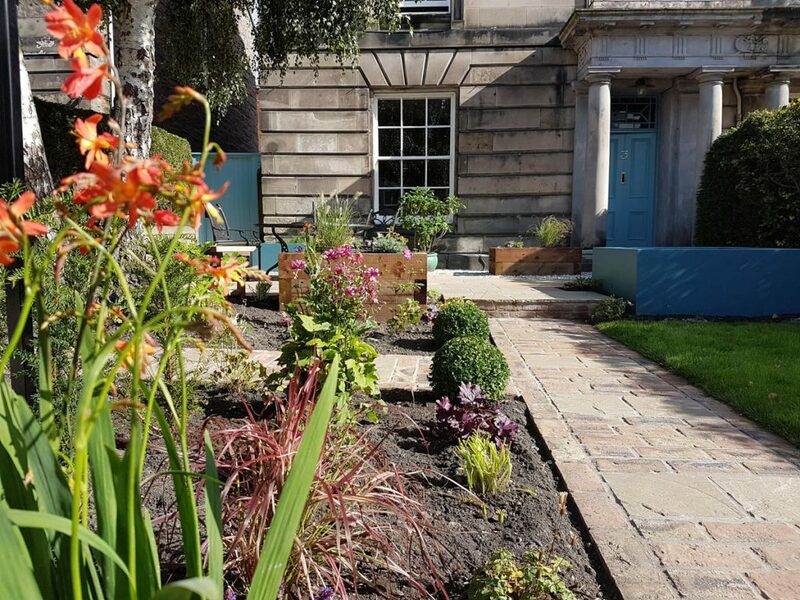 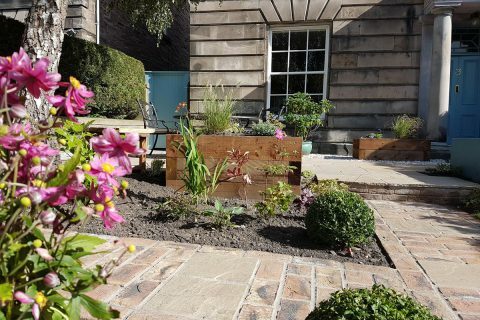 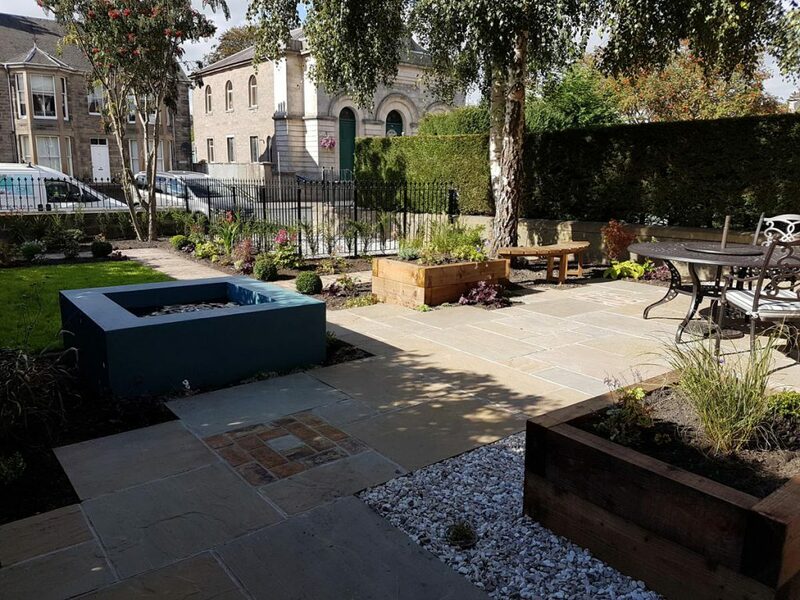 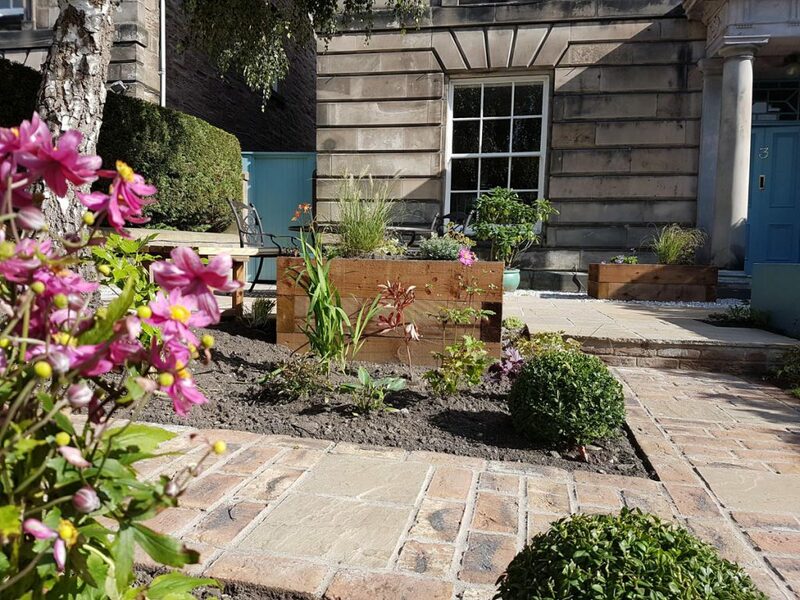 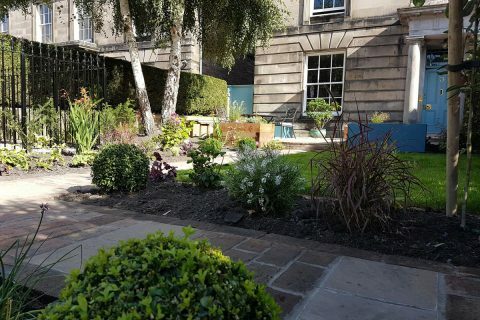 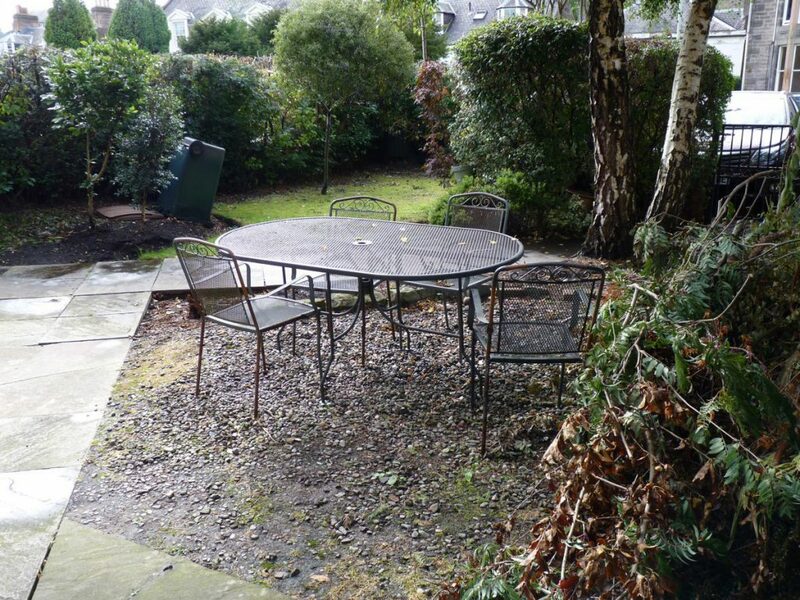 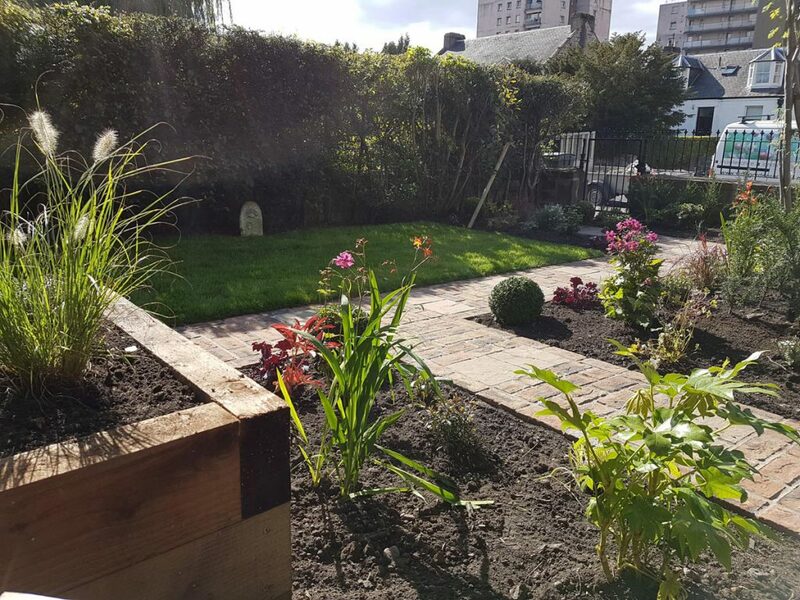 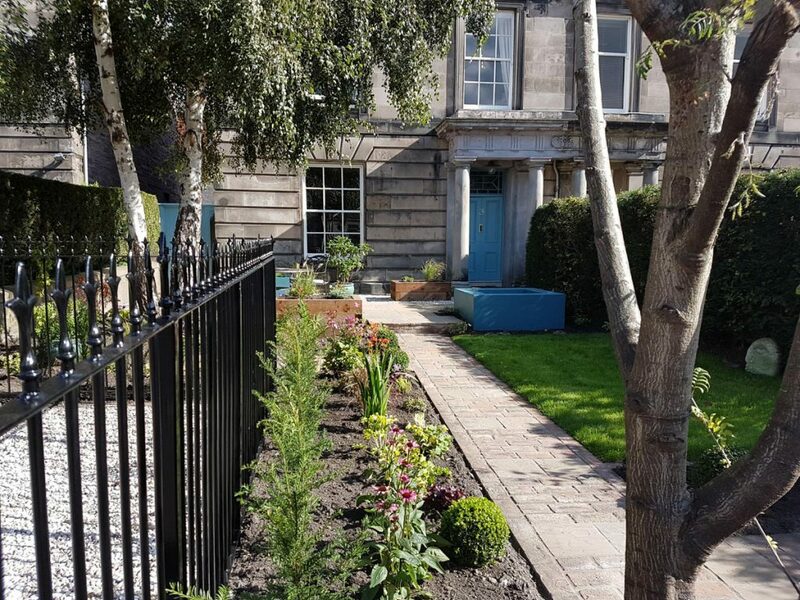 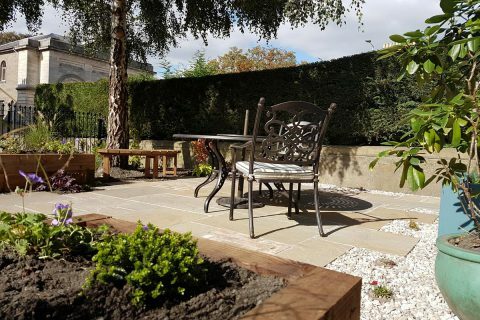 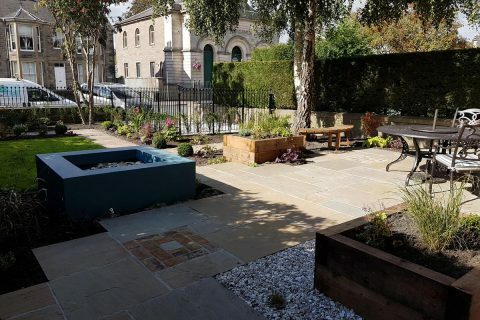 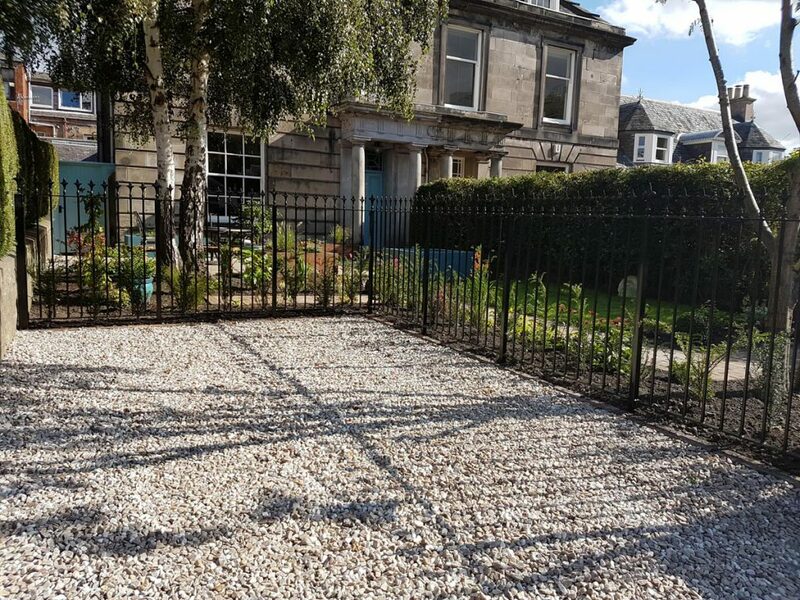 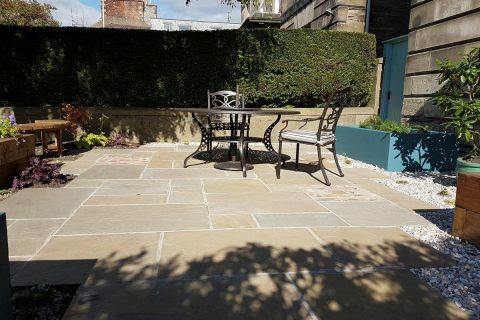 Our clients only had a tiny courtyard at the back of their beautiful Georgian house so they were keen on transforming their front garden into a space which was much more usable and relaxing in this spot in the middle of the city. 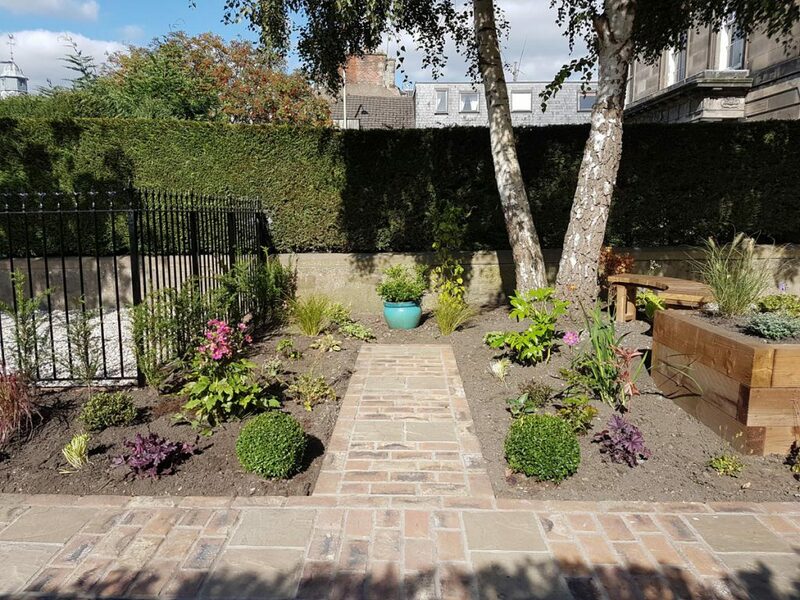 "The garden is lovely and we are very pleased with the plants and all the work done by yourselves and the staff. " 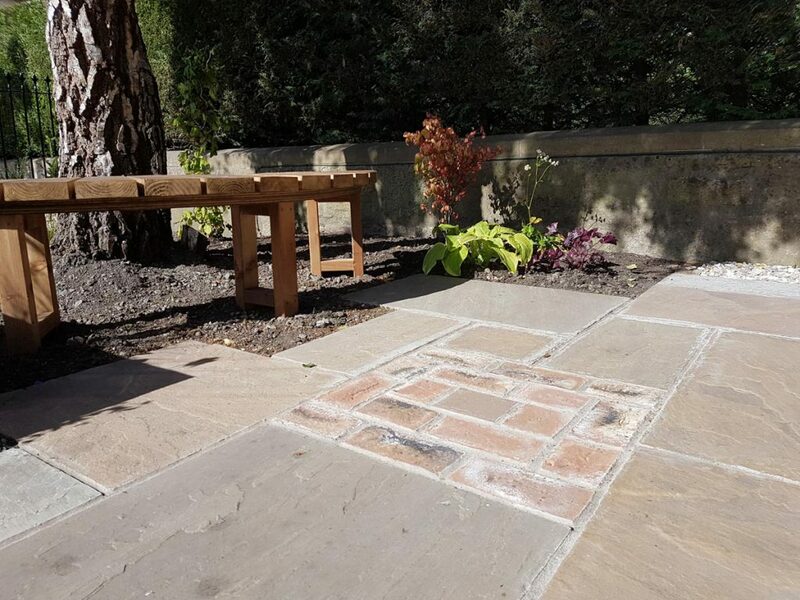 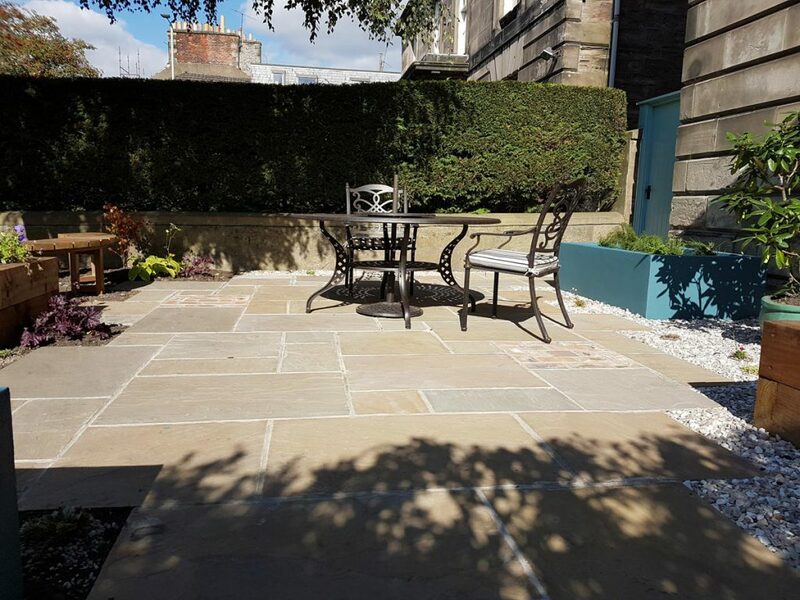 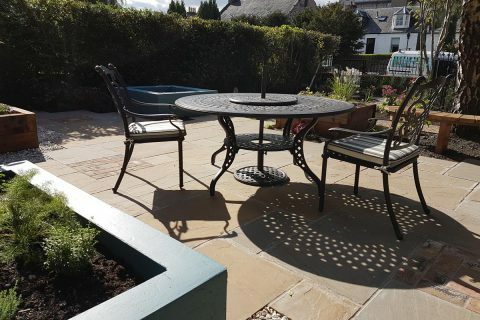 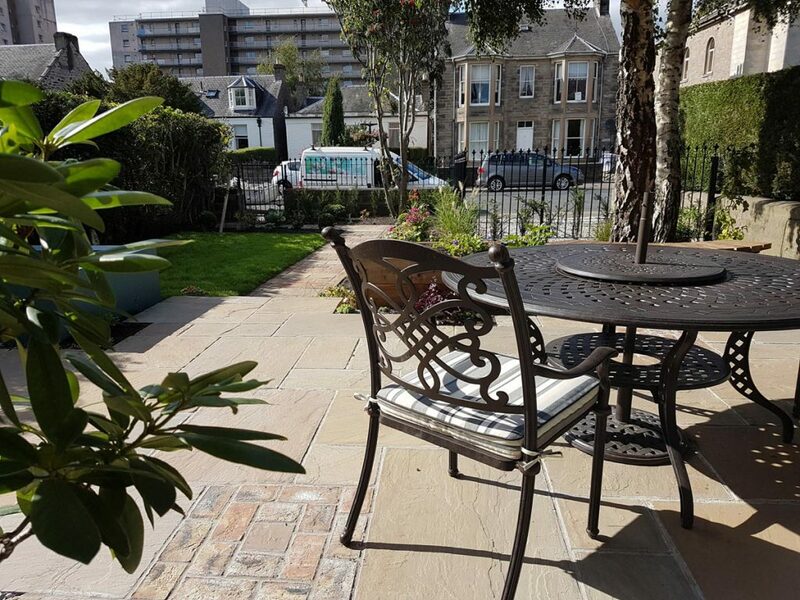 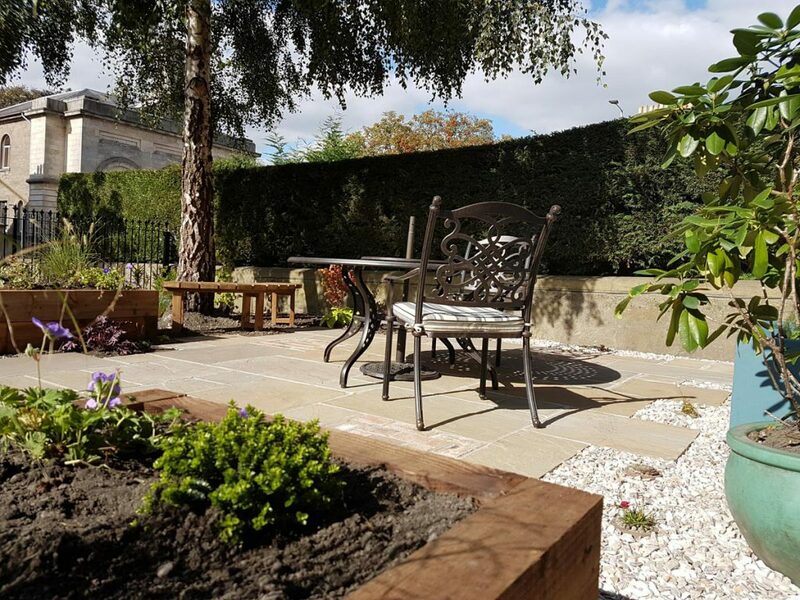 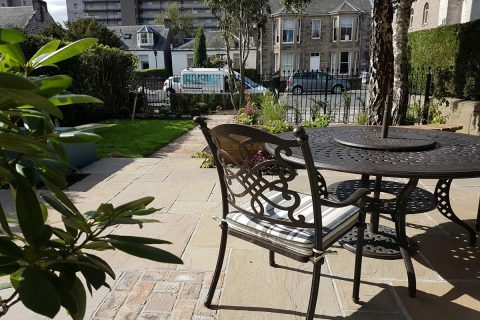 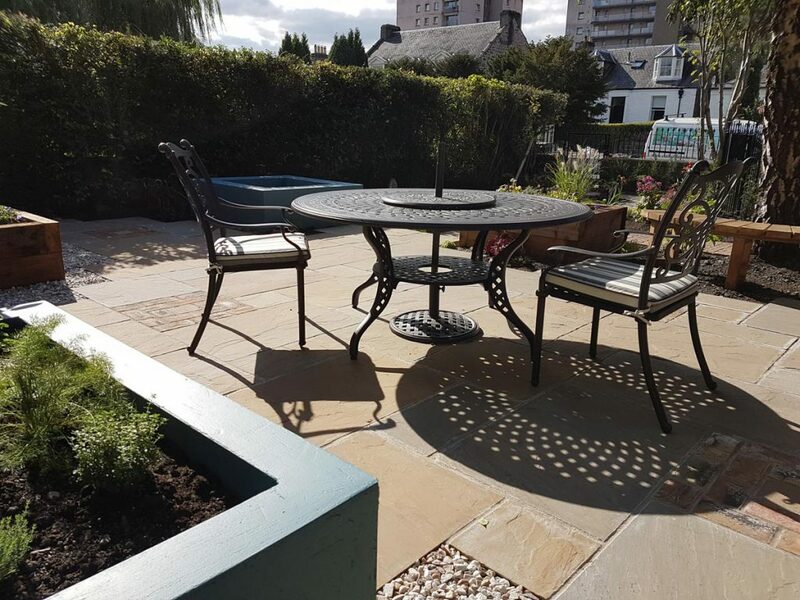 A sandstone patio has created a lovely space for the clients to relax in their sunny garden. 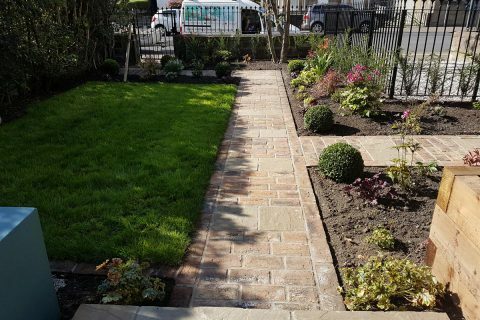 Brick detailing within the paving adds interest and is echoed through the paths around the garden. 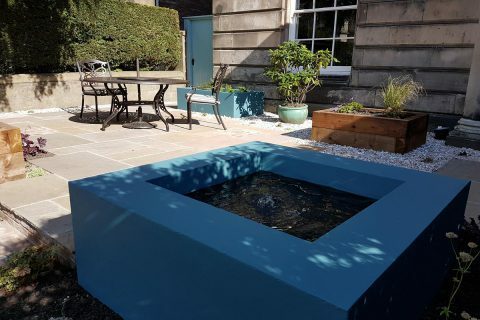 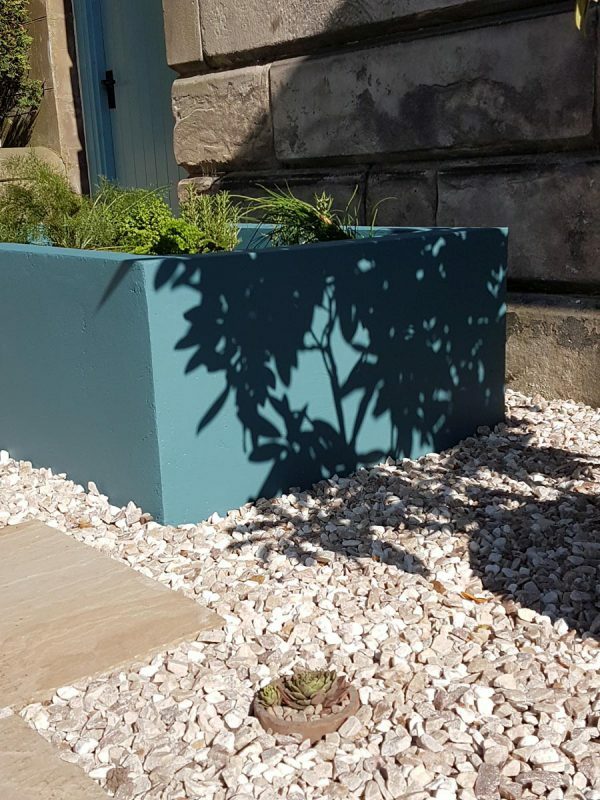 Raised beds were added to provide height and interest, some constructed in timber and others with a beautiful blue rendered finish. 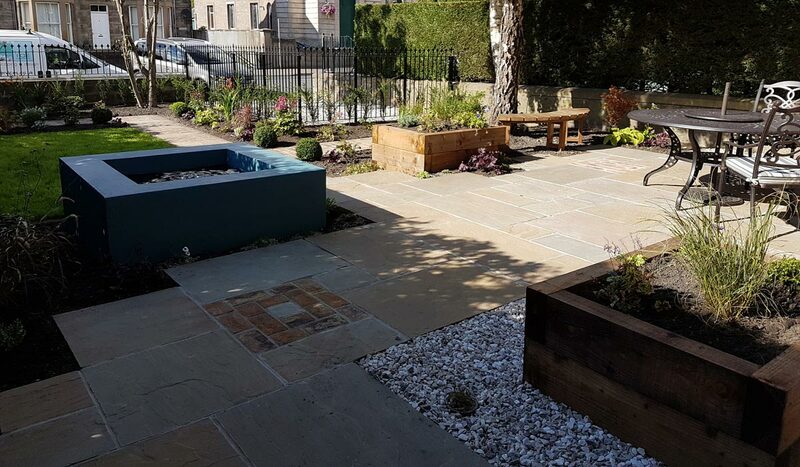 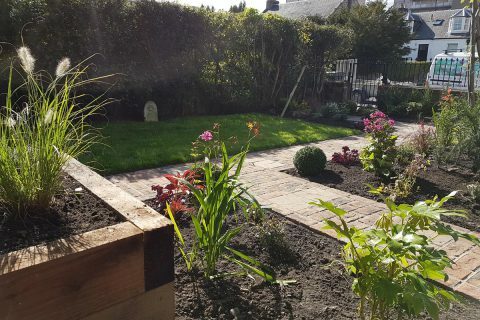 Most of the beds are planted to add colour and texture to the garden, one has become a herb garden and one is a new pond filled with aquatic plants. 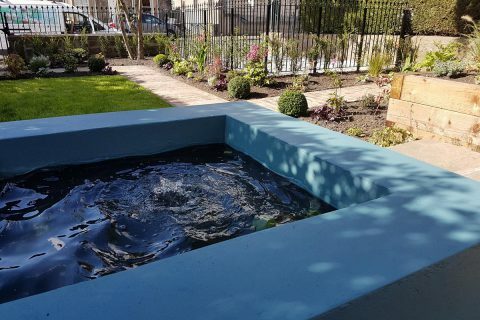 The pond provides a lovely relaxing noise, perfect for this city garden. 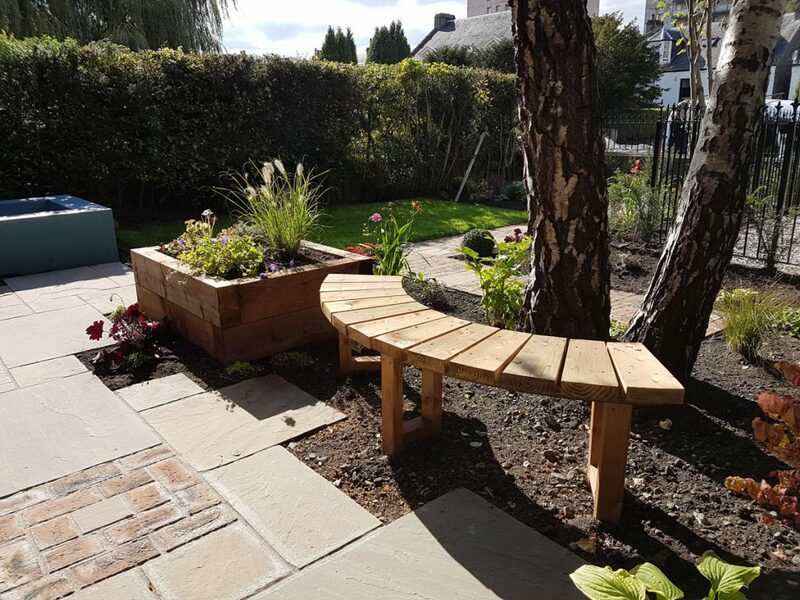 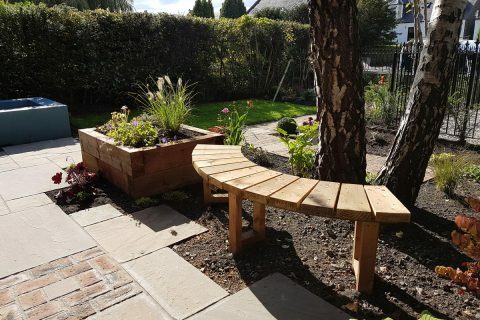 Under the existing silver birch, a beautiful bespoke seat has been crafted to give an additional place to relax and enjoy the garden. 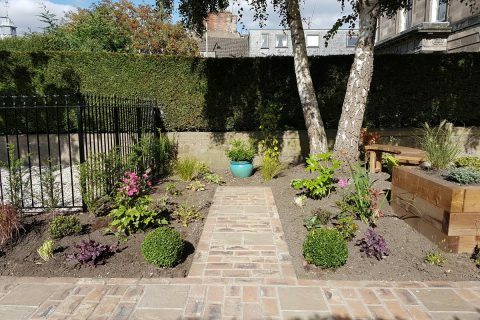 Alpines have been added in the gravel in pieces of old pipe and the borders have been filled with a wide array of planting providing year round interest. 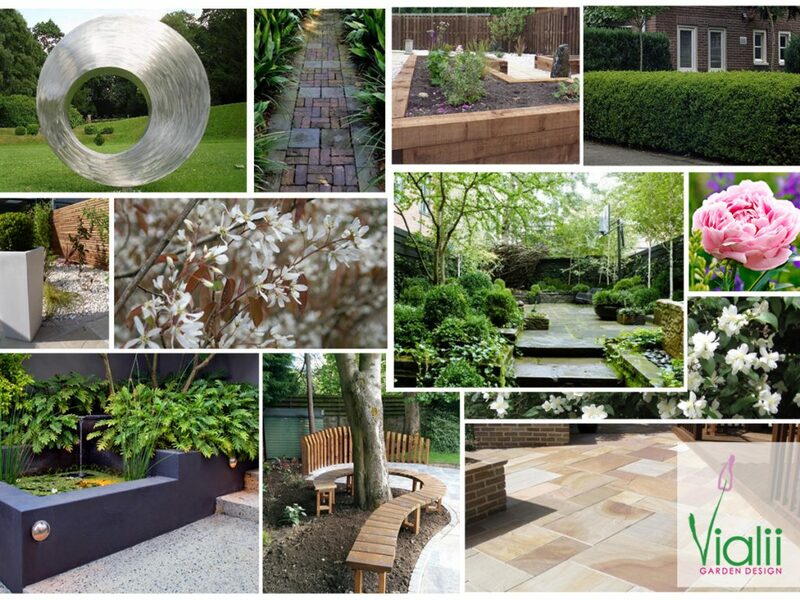 Shrubs include buxus sepervirens balls, philadelphus, osmanthus and hebe. 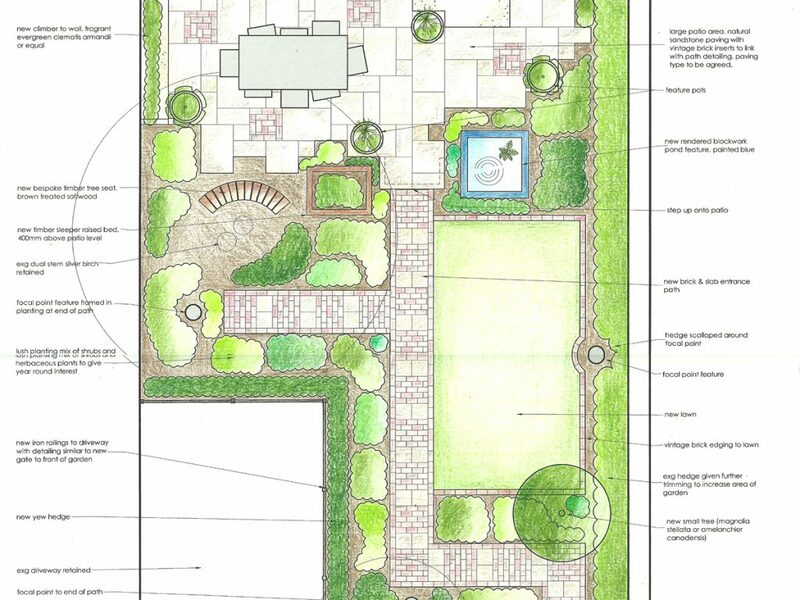 An amelanchier has been added for extra height. 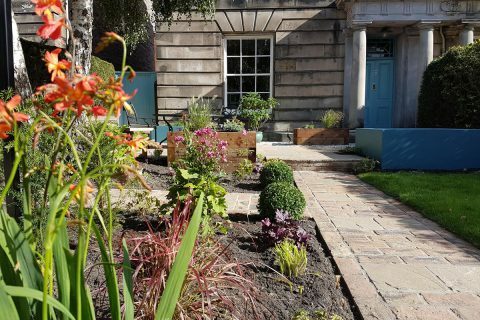 A wide array of herbaceous provides colour including echinacea, eryngium, crocosmia, heuchera and astrantia. 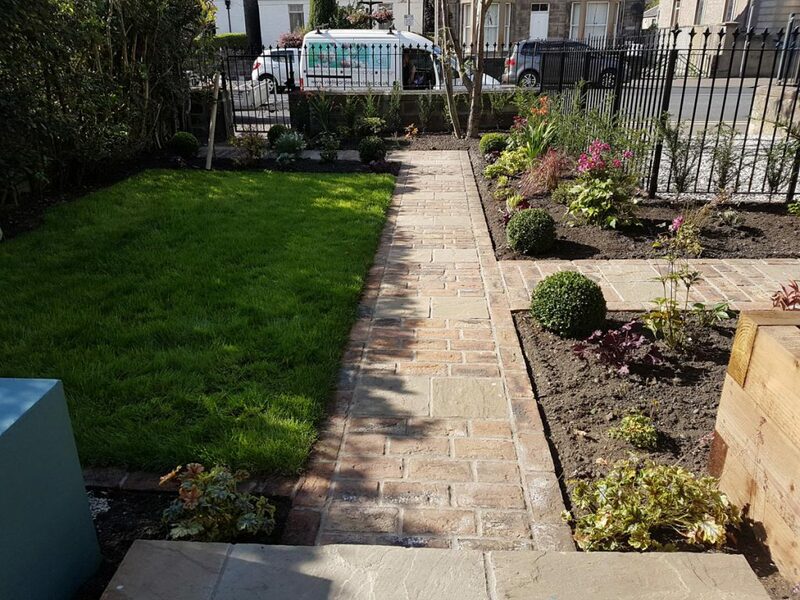 A new lawn edged with bricks was laid and to finish off the garden new railings to tie in with the house have been installed with some new yew hedging and new gravel added to the driveway.